We are being so obsessed with anchor this summer, I love any anchor printed pieces and I’m looking forward to grow my collection a lot until the end of summertime. 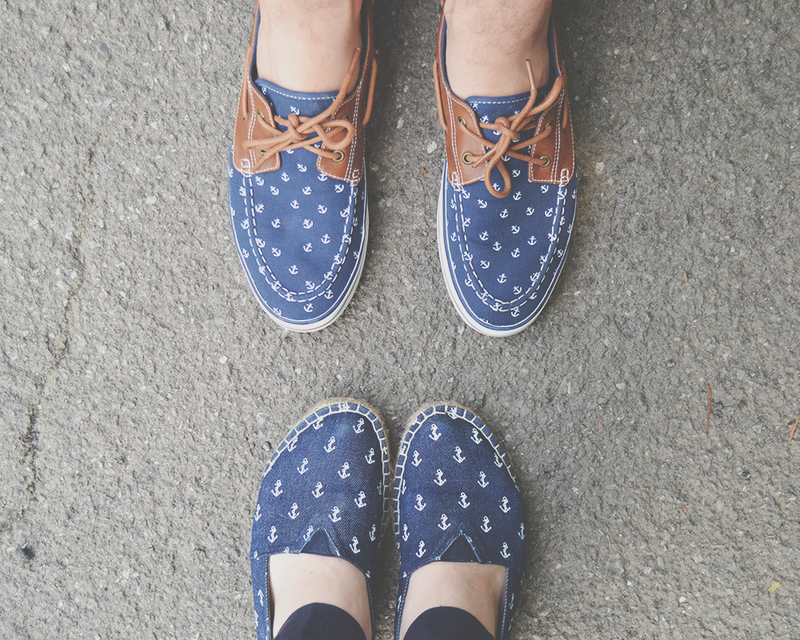 My boyfriend on the other end says he is looking for some good anchor printed shorts, but in the meantime we both bought some super cute summer-y anchor printed shoes and we’re so enjoying wearing them together the same day! My pair is a beautiful espadrilles, so lightweight and comfy like slippers, it feels like walking barefoot on a sleek and clean surface and are definitely my favourite pair of shoes this summer! I love how fresh and nice they look and feel and how easly they pair with a lot of outfits – and coming at only £10 they’re such a steal too! Try to not wear them on a rainy day though – it’s not a good feeling. His is a lot more structured yet still very lightweight pair of boat shoes, very comfy and summer-y but super versatile for other seasons as well. We love that the prints and the colors are pretty similar so we can wear matching outfits! What’s your favourite print for summertime?